* Giveaway is closed. Winner has been notified. My daughter has been eyeing the American Girl 2018 Girl of the Year for months! This holiday I’m excited to surprise her with her own Luciana. 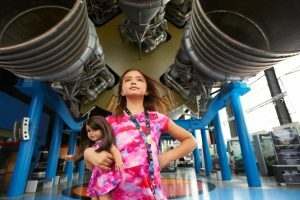 The 2018 Girl of the Year, Luciana Vega, is a creative and confident 11-year-old girl who dreams of being the first person to explore Mars. This aspiring astronaut hopes to venture to outer space one day but also knows the importance of being a team player and a good leader. I’m excited for my daughter to learn more about her story and I know she will relate as they both share a passion for science and outer space! 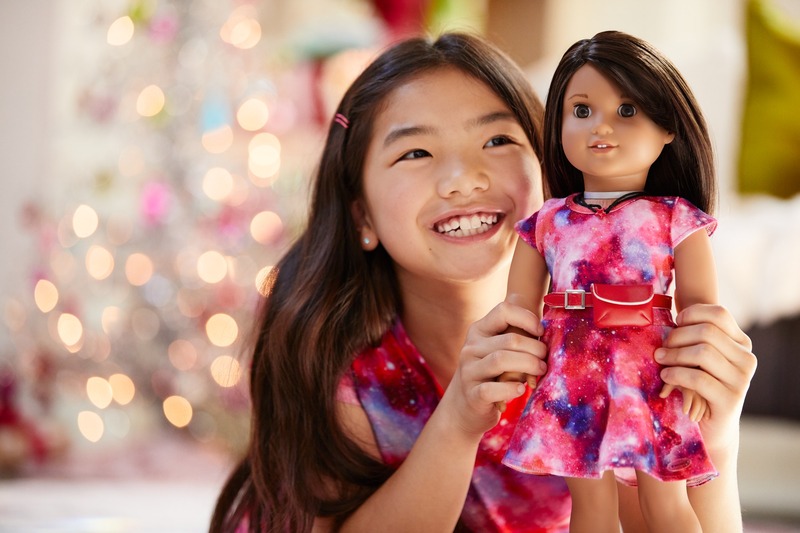 Luciana comes dressed in a fun cosmic print dress and red purse that she rocks to Space Camp. Her accessories tie into the space theme with the holographic choker and red charm necklace along with the lace-up space boots. She also sports a purple streak in her hair that expresses her creativity! The accompanying book narrates her story of how she works on becoming a good team player and leader on Earth before she shoots for the stars as an astronaut. Also available are additional accessories, including a full space suit and flight suit, that really help girls share in the adventure with Luciana. No doubt that Luciana will be a hit in our house over the holiday season and months to come! 1) Required: Subscribe to our Smarty e-newsletter. You MUST be a subscriber for your chance to win! Not subscribed? Get signed up, here! 2) Bonus: Share this post on Facebook and Instagram and tag American Girl & CSP. Let us know in the comments below after you complete. 3) Required: Tell us (by posting in the comments below) why your child loves American Girl. Make sure you include valid email address and first and last name so we can contact you if you are the winner. You’re one step closer to having Luciana join your family for 2018. All Smarties who complete the steps above (we will validate!) will be put into a drawing. Our winner will be announced in our Smarty e-newsletter on Friday, December 7th, so be on the lookout! Smarty Reminder: Register for YMCA Camp Thunderbird’s Winter Weekend & Family Winter Camp! The Smarty #MadeinCLT Gift Guide is HERE! My daughter loves the stories that accompanies the dolls. Each doll comes with so much to teach us. Thank you for the opportunity to win a new American Girl doll for my little girl! My two daughters have grown to love the American Girl dolls and many accessories. We even take time to go to the American Girl store and choose hairstyles and outfits for their current dolls. Winning a new doll for my youngest daughter would be wonderful, and she would be well loved. What a great giveaway. Following you guys for many years. My girls play so well together when they are playing with their American Girl dolls. The dolls and their stories empower them to dream of the impossible and build their own confidence. I have been collecting American Girl dolls for my niece for years. I love the collections and a good quality wholesome gift that I love to give. My Granddaughter loves American Girl. She just can’t enough of the doll and books, she reads them and then talks to us about them and the time periods. These dolls are such a great learning tool all wrapped up in fun. She loves learning how to do things with the dolls and how important things like cleaning house, ironing and washing dishes are essential. Selling with her store really teaches her how money exchanges work. 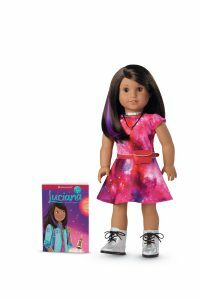 Now that American Girl has come out with Luciana Vega the astronaut it shows there is no boundary to what a girl can aspire to. Since she got her doll we can see a whole new confidence in her. Sorry, this is my entry, we had logged on to my husband Gmail and he didn’t change it back. Mine is Karen Propes, I hope this is ok. I have shared on FB and instagram our instagram is @chelseas_dolls. My daughter loves Ag and all other dolls, she loves having tea parties and setting them up to take pics. She has wanted Lucianna and Tenney for soo long and this would be great for her to win this one so it takes the pressure off getting them both before they are sold out. Thank you soo much for the oppurtunity. Subscribed and about share on IG trippleag_fan . My daughters love AG. They love the stories and movies. We have started with bitty babies stories and we are slowly moving into the bigger books since one of them can finally read! We love what they stand for and it also empowers my little girls. There are so many reasons my daughters love AG. Thank you so much for the generous giveaway. She likes that she can relate or feel empathy for the stories. My daughter has just started to be interested in American Girl Dolls, and I think it’s so cool that she will enjoy something I also enjoyed as a child. Subscribed and shared! My little girl Victoria loves American Girl because some of them lived “long ago” and I love the interest she takes in the different doll’s interests (like science!)! My daughter loves dolls and has been reading the American Girl doll books but doesnt have an American Girl Doll yet. My grandneice loves the dolls and all of the stories. She’s 9 and has been collecting them for a few years. She would love Luciana! I shared on facebook and posted to my instagram. My daughter loves her American girl dolls. Being of Hispanic descent, I like that she can identify with Luciana and look beyond the stars! Honestly my daughter has never had one, she’s seen them in the stores though and I know she would love it. Thanks so much for the chance!